Redesigned last year, Canada's best-selling pickup for nearly 50 years in a row continues to trek ahead of the competition. Changes for the 2016 Ford F-150 include a new trim level (Limited), a backup assist system when hooked to a trailer, and an upgrade to Sync, which is Ford's advance telematics and infotainment system. 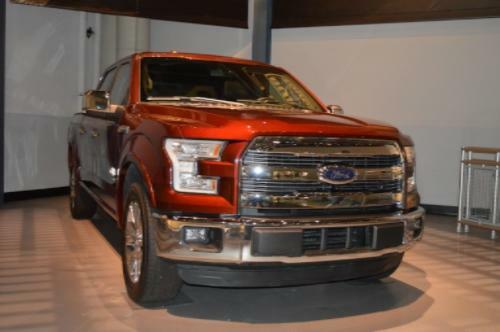 The 2016 Ford F-150 can be configured from three cab body styles, three bed lengths, four engines and six trim levels. There are 13 exterior colours available for buyers to choose from. There are even more interior colours (14). Various options are also available for even greater customization. The XL is the entry point into the truck lineup. A spare tire, an engine block heater, air conditioning and an active grille shutter system are just a few of the more notable features that come standard at this trim level. Also standard is a 3.8-liter V-6 engine paired to a six-speed automatic transmission with tow/haul and sport mode capability. Horsepower and torque is 282 and 253 respectively. Properly equipped models can tow up to 3,446 kg. Fuel economy is 13.2-14.0 L/100 km in city driving and 9.6-10.6 L/100 km cruising along the highway. That's with the standard rear-wheel drive. Models equipped with four-wheel drive see a slight increase in fuel consumption. Buyers have several ways to customize their XL. The available Equipment Group 101A comes with more popular creature features like cruise control and a more advance version of Sync. The Power Equipment Group adds automated headlamps, power windows and door locks, and a power tailgate lock. MyKey, which is a Ford exclusive, is also available. This system allows owners to configure several F-150 systems like top speed and even maximum audio volume. This not only allows parents to assist their teen drivers but can be used during valet parking. The XL can also be had with a different engine. The powerful 5.0-liter V-8 is rated at 385 horsepower and nearly the same amount in torque. Tow capacity is a jaw-dropping 5,035 kg. The smaller 2.7-liter V-6 and 3.5-liter V-6 turbos are part of the automaker's line of powerful and fuel efficient EcoBoost engines. The former pumps out 325 horsepower and 375 lb.-ft. of torque while the latter pours out even more at 365 and 420 respectively. Tow capacity ranges from 5,035 kg with the 5.0-liter to 5,534 kg with the 3.5-liter. All three of the above engines are mated to Ford's SelectShift six-speed automatic. This transmission can acts as either a conventional fully-automated shifter or semi-automated clutchless shifter. Drivers have to simply press a button on the shift lever to switch the transmission. The number of standard features, options and resulting configurations for the F-150 climb as one goes up the trim levels cumulating with the premium Limited. Contact Us to Test Drive the Ford F-150!